'Field in Italy' (2002): In Place of novelty, patient exploration. landscape trembles on the verge of vision." There is a line falsely drawn under the fine arts between artists who work in a traditional idiom and those who seek the cutting edge. Occidental art is, no doubt, self-transformational in a way that, say, Chinese art prior to Western influence was not. Byzantine art, even after encountering the Renaissance, remained substantially unmodified for another two centuries; rather, it was the West that took up Byzantine forms (just as China influenced the West long before the shoe settled on the other foot). This isn’t an either-or proposition. Dynamism has its place in art; so does the slow refinement of an essentially static tradition. Even within Western art, this dialogue continues. No composer was more astonishingly revolutionary than Johann Sebastian Bach in terms of emotional and structural complexity, yet his achievement was accomplished not only within wholly traditional forms but even using some that were considered retrograde by the avant-garde of his day. The 19th-Century argument between Brahms and Wagner posed a similar issue, dividing their respective partisans into hostile camps. I suppose they enjoyed the argument, but today we can simply enjoy the music. The avant-garde has taken, shall we say, a breather in much contemporary art. No one faults Cormac McCarthy for not being as innovative as William Faulkner, or Philip Roth for failing to advance on Kafka or Musil. Partly this is a matter of genius; we take what we can get, and not all ages produce artists of the highest caliber. Partly it may be a matter of consolidation: Early and mid-20th century art gave us a lot to digest. The one arena where the avant-garde still pushes hard is the plastic arts. The passing of Robert Rauschenberg— who fractured and refractured the picture plane, mixing genres the way other artists mixed paints— reminds us that the optic nerve is the most revolutionary organ of the human imagination. But that which is chiefly novel loses its luster quickly enough, while patient exploration of an established language can yield unexpected pleasures. Barbara Rosin’s current show at the Cosmopolitan Club is a case in point. Rosin not only works in a style— Impressionism— that the fine arts seem to have yielded to commerce, but her subject, the Umbrian countryside of Italy, is a thrice-told tale as well. Yet her responses are fresh and vivid, her brushwork is fluid and supple, and her imaginative engagement creates a crepuscular world where landscape trembles on the verge of vision. This is not Italy as it has come down to us since the time of Claude; nor is it the intensely visionary Mediterranean landscape of a modern master like de Stael. Rosin responds to this grove and that field, letting structure bleed forth slowly from perception, and a certain indeterminacy leads the viewer toward a mystery it is best to indicate rather than specify. She is particularly adept at loading her brush to achieve striplings of thinness and thickness that let the viewer’s eye shape its own forms. This is perhaps most true of her “Zembla” series, with its twilit aura. But all Rosin’s work is interactive in the best sense, an invitation to enter a field of vision. This show is one of the pleasures of Philadelphia’s spring season. Barbara Barasch Rosin was born in Philadelphia. She studied at the University of Pennsylvania, Tyler School of Art, and the Fleisher Art Memorial. She has had several artist residencies, at Vermont Studio Center and in France and Italy. Over the past thirty years, she has exhibited paintings in numerous galleries, art centers, and public spaces. Her paintings are in private collections in Philadelphia as well as in New Jersey, Delaware, Ohio, New York, Massachusetts, Vermont, Virginia, Louisiana, Florida, California and Oregon. Her work has been shown abroad in Paris, France, and in Italy, where her paintings are currently on exhibit in Assisi and in Todi. 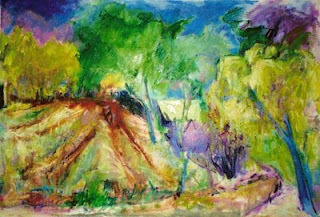 Barbara Rosin has worked as an art therapist and has taught for over thirty years. She has illustrated several book covers, including sociological texts, cookbooks, and poetry journals. Her work has been shown widely in numerous juried shows, as well as in ten solo exhibits. She has been a featured artist for the last seven years in the Philadelphia Artists Open Studio Tour.